I admit that basketry is something that intrigues me. The weaving of virtually whatever materials you can find and creating a sculpture that can be both beautiful and functional is just so cool. I’ve never tried it. Maybe one day I will. What I never realized was just how many different terms are used in the art. 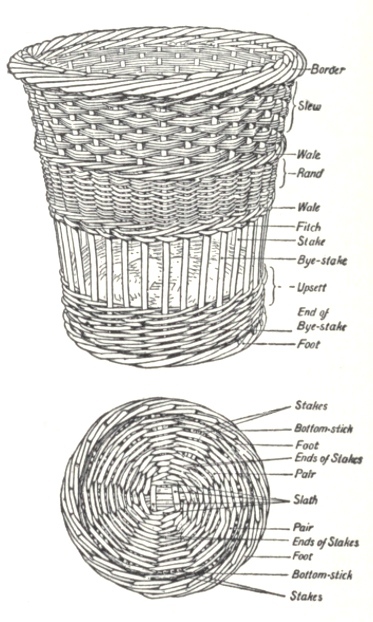 The entry for basket in the 191 Encyclopedia included this basket parts drawing. The basket alone would make a great crafting illustration but with all of the basket parts identified, this is an even more useful illustration for anyone wishing to illustrate their art. From the border to the slath, this basket parts drawing identifies each of the parts with clear labels.